UPDATE: On 8-19-12, this post was updated at Joel Hill's request with a slightly expanded version of Joel's article. "The Jousting Life" is pleased to announce that we have our FIRST GUEST WRITER. Joel Hill is an aspiring jouster and has written this article describing his quest to become competitive in this new/old extreme sport. My name is Joel and I'm new to the sport of jousting. I grew up in Norco, California and have been around horses for most of my life. I've always been a fan of contact sports with hockey being my favorite. Jousting provided the opportunity to combine my love of horses with my love of hockey, but unfortunately the shows that were done at Rennaisance Faire's in my area at the time were pretty awful and turned me off to the idea. 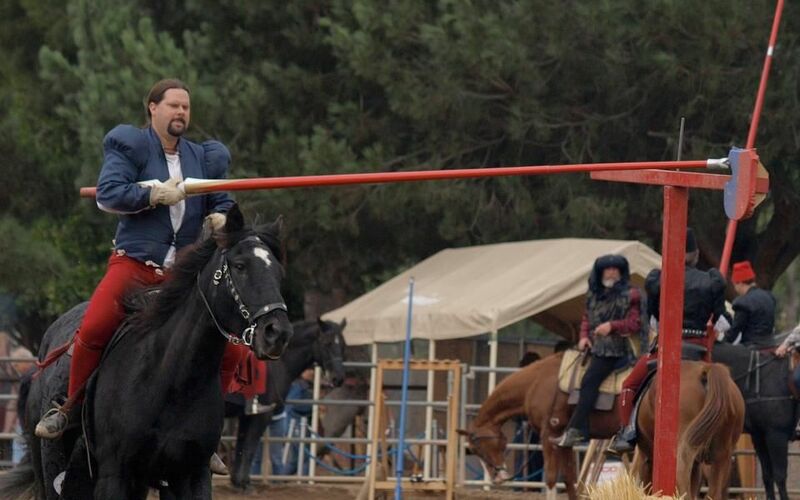 But in 2009 that all changed when I got to see a side of jousting I didn't think existed. It was real competition, not some show. For about 10 years I had been with a Renaissance faire guild called the Archers of Ravenwood. Their focus was medieval archery in the middle 15th century. In 2009 the group was invited to provide a historical archery tournament at the Tournament of the Phoenix in Poway CA. After watching the first session of jousting I instantly became a fan boy, which at 35 years old, I didn't think I was capable of doing. I couldn't help but be fascinated by the spectacle of it all. Listening to the announcers provide not only color commentary but historical information as well. It was a very real competition but a tribute to the historical styling in which it originated. The crowd was going nuts every time the lances broke, not because some barker told them to cheer or what to cheer, but because they were legitimately excited and into this event. By the end of the first day I was totally hooked and had to see if I could do this myself. So on Sunday I approached the place where the competitors hung out between events. This was the first real surprise. My experience in the renn faire circuit is that the jousters duck out back stage when the show is over and that's where they hide until the next show. At this event the competitors were right there with the crowd and they were actively engaging in conversation with the public while resting and preparing for the next event. This is where I met Luke Binks. He was the one that told me that if I really wanted to do this, there really isn't any reason why I couldn't and gave me the information and encouragement I needed to get started. I really think if it wasn't for his words, I don't think I would have signed up for my first lesson. Luke Binks(left) and Charlie Andrews(right) joust at "Lysts on the Lake 2012"
The tournament was in October, I didn't sign up for my first lesson until January. The reason was that I wanted to make sure that this was really what I wanted to pursue and not some over excited fan boy moment I was going to regret later. 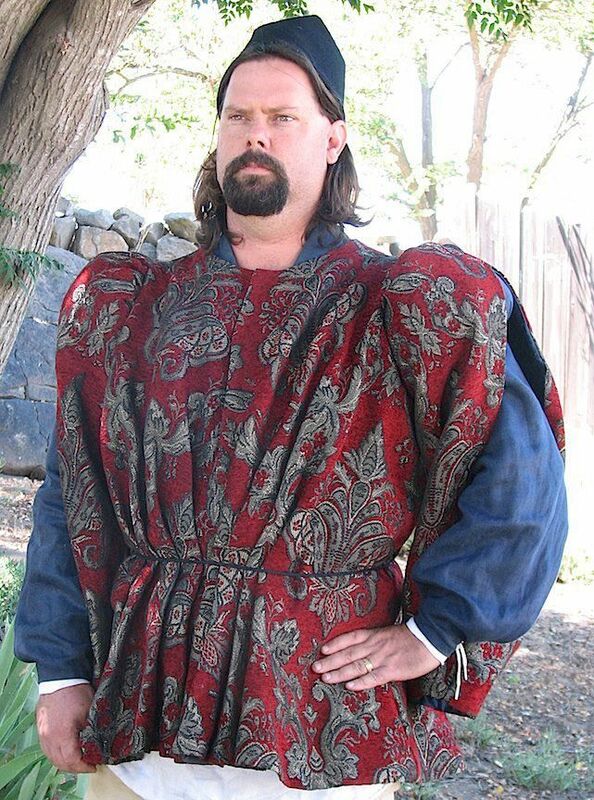 I signed up for classes with Jeffrey Hedgecock at his Knight School. Jeff and his wife Gwen were very welcoming and graciously answered all my annoying questions for weeks leading up to the class. The first day was a huge lesson. I signed up to learn ground crew basics and work my way up to riding. 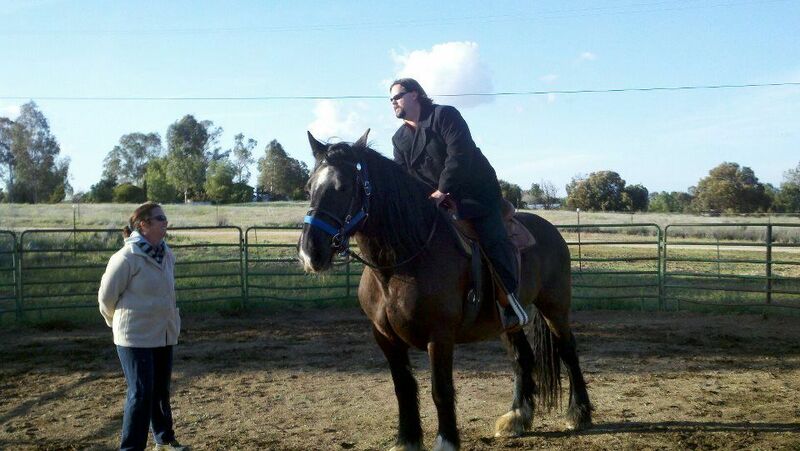 They put me on one of their horses later that day and helped me get my riding down again. It is absolutely amazing how much you can forget about riding when you haven't done it in 15 years. Frankly I was embarrassed about how poor my riding was, it was a wake up call, but Jeff was encouraging and helpful and because of that I signed up for another lesson. At his urging I also found an instructor for horseback riding lessons to better my riding when I wasn't training with him. After 10 months or hard training, Jeff invited me to participate in the mounted skill at arms contest at the Tournament of the Phoenix 2010. It's very very different doing the games in front of an audience that is cheering for you. In the company of friends is one thing, but the adrenaline and intensity kicks up a few notches when you are in front of people who are watching you. I wound up doing much better than I thought managing to tie for second place in points. This just increased my drive, because now I know I can learn to do this and do a pretty decent job of it. 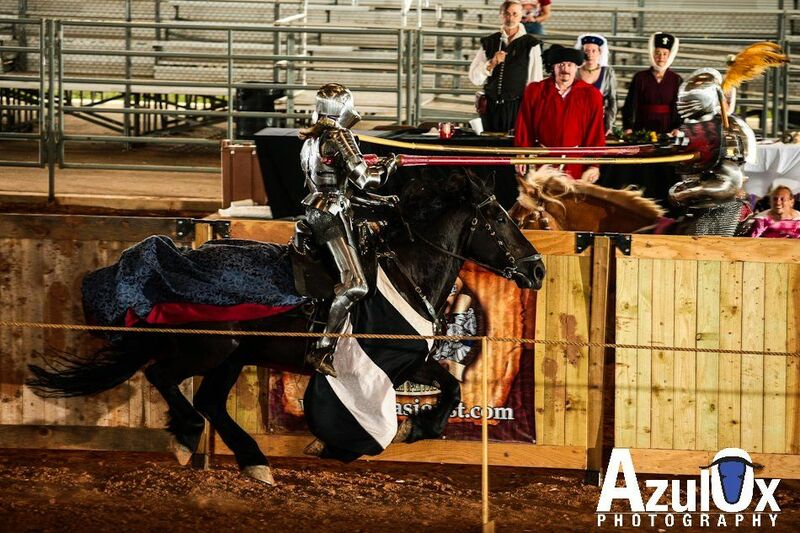 Jousting takes more than just being able to sit in a saddle and run in a straight line. The skilled jousters make it seem easy, but it is much harder than it looks. Jousting is the epitome of multitasking. You're riding a horse, holding a lance, aiming the lance, striking your opponent while being struck at the same time and then coming to a controlled stop at the end, all while avoiding giving your horse bad signals. You must maintain complete control over your lance, your balance in the saddle and your horse the entire time. Only a skilled rider can do this; unskilled riders are merely targets. I've consider myself lucky having grown up in Norco, CA. I've met a lot of horse people, and those friends had friends for me to talk with about what I wanted to do. And that's when I was introduced to Becki who is currently teaching me to ride. Rebecca Cook has been in the business of horses for over 20 years. Halter, dressage, hunter jumper, racing, you name it, she's been involved with it in some form or another and has enough ribbons and trophies to blanket a couple of large walls in her house. She has a farm near where I live where she rescues, rehabilitates and adopts out horses, as well as giving lessons in various styles of riding. It was Becki that found me my horse, a beautiful English Shire mare named Loretta. The previous owner had some personal tragedies occur, and for a couple of years he was only feeding his stock before deciding to just offload them all. Becki rescued Loretta from the slaughter truck for free and decided she would be perfect for me and my goals. She also has a pretty dressage stallion she wants to eventually breed Loretta to, so it was a win-win for both of us. And now I have a horse to learn to ride on and compete with when I'm ready. She's not fond of the games targets right now preferring to steer clear of them rather than getting in close enough for me to hit them, this will take some work and a horse trainer I'm not, so this should be interesting. I'm learning that getting off the ground is much harder than I had expected. Jousting is an expensive sport. Well it is if you want to be good at it. Two key components of this are the equipment and the ability to ride. 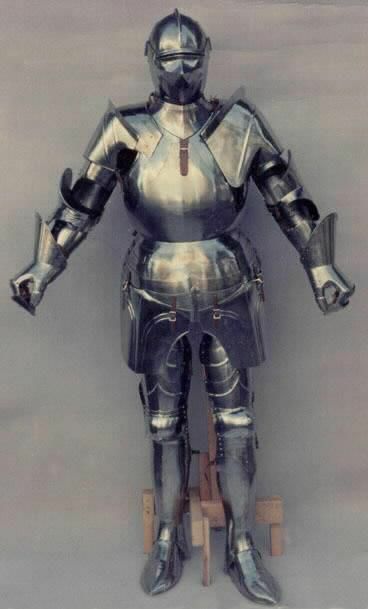 The most expensive equipment is the armor itself. You can easily find an online shop or some guy who promises to make you a custom harness for cheap, but it won't fit right and will be more a hindrance than a help. You need your armor to work for you, not against you. If you're constantly fighting to move in your armor, you'll never be able to reach your full potential. Cheap suits equal cheap materials, which equals more frequent repairs, which means, in the long run, the cheap suit is costing you more to keep in working condition than a good quality suit would have cost you at the start. In order for you to be an effective competitor, you need a quality suit, made from quality materials and made to fit you like a custom tailored suit, and this is expensive. I'm not rich. I don't own my own business, haven't won the lottery (yet) and I don't have wealthy parents. So I'm stuck begging, borrowing, and saving to afford my harness. It's been recommended that I seek a sponsor or ten to help finance my dream. A veteran competitor named Lloyd Clark has even written a document that contains his recommendations on how to obtain sponsorships. It has useful information in it and has worked well for him. But obtaining sponsors is not an easy thing, in fact the only company that was willing to help is bound by policy to only give money to a non-profit organization. My hometown is a cow town which means if you aren't roping, cutting or doing some kind of rodeo related activity, they aren't interested. Cutting edge or outside the box sports like jousting just aren't their style, and even worse, they have a negative image of the sport because of what they've seen on TV and at renaissance faires and dinner shows. I found a donation site, www.gofundme.com that I thought I'd give a try. Seemed like a fairly decent way to utilize the internet to seek financial help for my dreams. So far it hasn't been terribly fruitful but I haven't had it up for very long. Also can't say I'm surprised, I am asking for money in a tough economy after all. I'm also considering a bank loan, but we'll see how that goes. In the mean time I continue to ride and train at the mounted skill at arms. I've been training under Jeff for 3 years now and it's been great. I've been trying to learn all I can about the sport, the people and the inside pieces that bring a tournament together. Since I started training I have volunteered to help with the Tournament of the Phoenix. Last year I was placed in charge of the grounds responsible for making sure all equipment is in place and in good condition so that the events can run as smoothly as possible. I did my job well enough last year that they invited me back to do it again this year. And to add a little extra bonus to it, I have also been invited to compete in the mounted skill at arms contest again at the Tournament of the Phoenix! I'm very excited but also very nervous. While this will be my second time competing at this event, this will be Loretta's first time and we still haven't gotten her over her fear of the targets. Should make for an interesting event but regardless of what happens I intend to enjoy myself. So that is my story. I'm extremely appreciative of Jeff and Gwen for their help and guidance throughout this, Luke may have given me the push I needed, but I would never be where I am now if it wasn't for Jeff and Gwen's help. To me they, along with Becki, are central to my success and I hope that I can repay that kindness someday. And I look forward to hopefully being able to take the field and cross lances with all the people I look up to that I have met along this journey. Time will tell. I'm right there with you Joel, charge on and good luck. Maybe someday we'll meet in the Lyst! I have just started on my path to become a Jouster. It is a boost to my morale that I’m not the only one fighting to follow my dream and I know we both can and will succeed. I wish you all the best in your commitment and hope to one day meet you on the Lyst as well. Thank you, I read your and I wish you luck, I've heard good things about your trainer Dustin Stephens.